In his masterful and haunting documentary "Up the Yangtze," Yung Chang shows the old China drowning helplessly under the weight of the new. Looming over the film, physically and metaphorically, is the nearly complete Three Gorges Dam in the interior province of Hubei; begun in 1994 and scheduled for completion in 2011, it's the largest hydroelectric project in history, and China's most ambitious public works effort since the Great Wall. Some scientists theorize the collected weight of water may affect the earth's rotational axis. 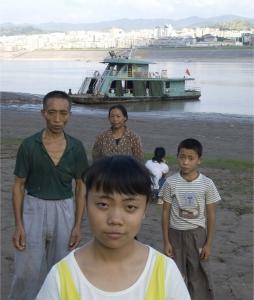 The environmental impact of Three Gorges has been widely reported, but Chang is more concerned with the social costs. Some 1.4 million residents have been relocated by the Chinese government to date, with the total number of those affected estimated at up to 4 million, or 1.5 percent of the provincial population. "Up the Yangtze" skips over the enormity of numbers, though, and shows us a handful of people desperately trying to adapt. One of the dam's more bizarre consequences has been the rise of a bustling tourist economy. Luxury ships, dubbed "Farewell Cruises," take wealthy Western tourists up the Yangtze for a last look at the ghost towns and cliff faces before they disappear beneath the current. Signs posted on the banks show the level where water will eventually reach; these function as both promise and threat. As houses and livelihoods are taken away, a number of locals have no choice but to work on the riverboats. The region's young people especially are attractive, ambitious, and have the necessary command of English, and the movie shows their growing pains as they join the service class. The film's heroine, as such, is Yu Shui, a 16-year-old girl whose dreams of going to college aren't taken seriously by anyone but herself. Her parents, illiterate subsistence farmers whose shack barely clings to the riverbank, hustle her into a job on the "Victoria Queen," where she's given a uniform, an English name - Cindy; it fits her like a fast food uniform - and put to work washing dishes. She weeps at the injustice and slips into a funk. Yu Shui's opposite number is Chen Bo Yu - Jerry to the Americans and Europeans - a handsome and cocky young man who can't believe the money the Westerners throw around. He seems the very face of the Chinese economic miracle, politely shaking tourists down for tips, but one of the themes of "Up the Yangtze" is that old ways don't die that easily. Naked ambition can be a sin in the eyes of the tour boat manager, who understands all the rules his young employees have yet to grasp. The paradoxical pleasures of "Up the Yangtze" include the stark beauty of the images - Wang Shi Qing was the cinematographer - and the hypnotic pull of Hannele Helm's editing. Some of the film's funding comes from National Geographic, and the visuals have a luxuriant coffee-table splendor that sometimes works at cross-purposes with the film as a whole. Yet Chang has a real gift for the symbolically loaded shot: a Lancôme poster next to a Chinese flag, Yu Shui's father passing Chinese sightseers as he carries a dresser on his back up the long slope from the water. The director's able to discreetly film a street protest, too, and the roughness of the footage hints at the harshness of the relocations. "Being a common person in China is too difficult," a shopkeeper tells Chang before unexpectedly bursting into tears. "Up the Yangtze" is impassioned reportage masquerading as poetry, and while the film rarely explicitly addresses government policy, there's not one frame that isn't political. That includes the wordless climactic time-lapse sequence in which the rising river swallows houses, trees, land, and lives, leaving behind a vast inner sea. The movie strains to listen to the ghosts beneath the surface.